It would be highly unusual to go to a conference and not get any new ideas! I couldn’t wait to get home and implement some of the things I learned. I had the honour and privilege to hear Linda Lacour Hobar speak. If that name sounds familiar, she’s the author of The Mystery of History curriculum. Her closing keynote was packed full of nifty ideas. For example, she spoke about having one in-service day once a month. The way the in-service day works is there’s no school on that day but everyone chips in and does some deep cleaning and work projects around the house. YES! Oh, do I ever need that! The majority of my days are spent with my children. Outside of the periodic homeschool meetup or field trip, I rarely get the opportunity to connect with other homeschoolers. The homeschool conference gave me an opportunity to make connections with other homeschooling families. It was especially exciting for me because I got to meet a Deliberate Homeschooling reader (Hi Loui!) and I also got to meet fellow homeschooling blogger, Angela, from Homeschool Innovation! It’s a blessing to make connections with other people who are passionate about homeschooling their children. The inspiration I got from this conference exceeded all my expectations. The love and dedication of the families at this conference was palpable. To be among families who cherish and adore their children so much that they want to educate them was a remarkable feeling! Moreover, I didn’t expect to be spiritually fulfilled by the talks! Many of the sessions I attended had a Christian component to them. One of my favourite sessions was on worldviews. The speaker emphasized how Christians are often trying to be “nice” and do everything they can to avoid offending others. It was convicting and a very compelling talk! Oh. My. Word. This convention had a huge hall jammed with vendors from every possible corner of the homeschooling world! If I had known the variety of exhibitors, I would have budgeted more for curriculum purchases. My daughter loved the used book tables and was able to add some books to her Our Canadian Girl collection. I loved that I could buy next year’s books, and since I purchased my curriculum at the conference, I saved on the shipping costs! What I love most about shopping at the homeschool conference was that I got to look through the curriculum. I’ve made the mistake of buying curriculum without looking at it first. Curriculum is often expensive! It’s nice to have the opportunity to look through it before buying. I spent a lot of time leafing through books and assessing our curriculum choices for next year. I left the homeschool conference feeling so encouraged. I attended a fabulous session about what research says about homeschooling. Let me just say that the statistics and reports shared in that session reassured me greatly. Some statistics indicated that homeschooled children are more likely to obtain a higher education. Also, homeschool children are more likely to start up businesses! There were also many statistics that indicated how homeschooled students grow up to be active, involved, and vibrant contributors to their communities. You can read the detailed research reports HERE. I marveled at these statistics and felt renewed with our decision to homeschool. 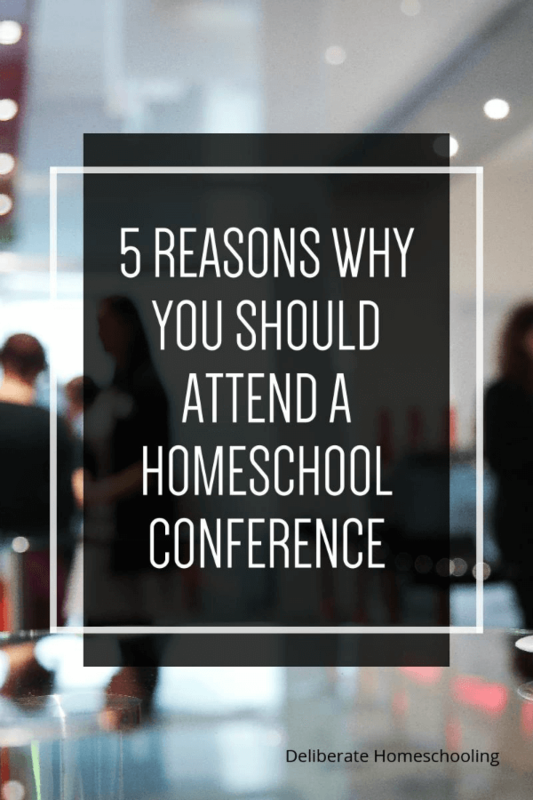 I want to know… have you ever attended a homeschool conference? Then, I invite you to share this post with your homeschool communities. I used to love going to our state-wide conference when I was teaching, for these very same reasons. I love the inspirations I get and the encouragement that I hear, and also the shopping I can get done! I’m so glad you had such a productive time at the conference! You truly are such a great mom for bettering your techniques and ensuring that you’re teaching your kids the best way you know how :) As always, thanks for sharing! I love conferences! When I worked in the childcare field, I was on the provincial child care conference planning committee for six years and I presented four times. I find I get so many new ideas and feel rejuvenated after learning and connecting with like-minded individuals. Thanks for sharing your thoughts on this Maria. I’m actually afraid to try out a convention; I’m afraid I’ll buy up all sorts of new curriculum materials to try that we’d just end up dropping a few months down the road. But I must admit the different talks sound so appealing! Yes, it can be hard to resist the curriculum but I loved being able to assess it before buying. The talks were awesome and so inspiring.